The Mandala is the most commonly known form of sacred art and has been used as a form of healing for centuries. The mandala holds the essence of a specific thought or concept and is used as a tool to focus the mind. When the image is placed in a circle it represents the self. It creates unity where unity might be missing as is the case when you are dealing with a specific issue. Because disease, illness and challenge reflects a breakdown in the holistic unity of the body/mind/spirit the mandala can be a powerful tool for healing the breakdown. Katelyn has been creating Soul Image Mandala for 25+ years and hundreds of people have benefited from having her create a personal mandala. 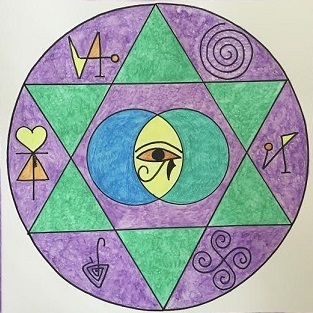 She is now focusing on creating Soul Image Mandala, which are messages from your future self. Each Soul Image act as a powerful tool for shifting you, giving insight and revealing information that will support your journey. These images are created by connecting with your wise future self who can give you a prospective you don't have right now. The Soul Image will help you draw in that new reality. The Soul Image is used as a meditation piece. The Soul Image are designed with symbols and colors which create a shift in our energy on a physical, spiritual, emotional and subtle level. The colors, symbols and geometric shapes alter our electromagnetic field. The more you use it the more powerful it's medicine. Each symbol and shape is chosen specifically for the client and the issue they are working on. You can also purchase a 3 to 4 page reading which will break down the symbols and included an intuitive reading. The images are 10 inches X 10 inches and are done in watercolor. It is well worth the price to have an original of Katelyn's work that is made specifically for you that will change your thinking.